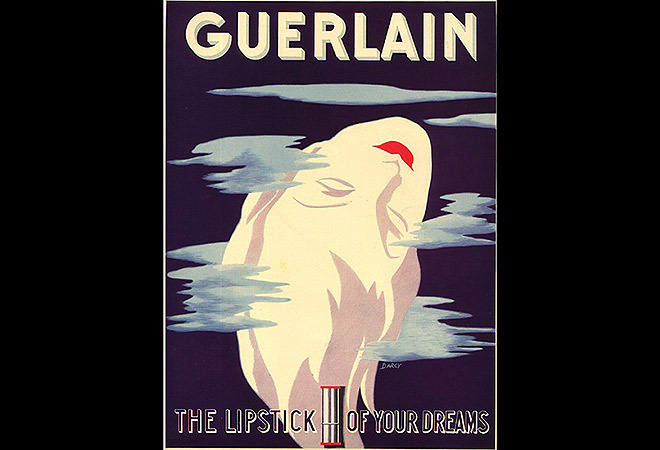 I won this Guerlain lipstick advertisement from 1937 in an online auction for $15. I was immediately drawn to the stunning artwork, and I’d been a fan of the Guerlain brand for more than a decade. Their classic perfume Shalimar, created in 1921, is my signature scent, and I wear Mitsuoko (1919) and l’Heure Bleue (1912) every now and then as well. A picture is worth a thousand words, and Guerlain understood that before many of its competitors. During the 1930s, cosmetics advertising ran the gamut—some companies offered lengthy treatises on the virtues of their product while Guerlain frequently relied on sumptuous graphics and an economy of well-chosen words. The Guerlain ad is brilliant in its simplicity—any woman reading the tagline “the lipstick of your dreams” would automatically imagine her own requirements for the perfect product. The father of modern psychoanalysis, Sigmund Freud, said that “wish-fulfillment is the meaning of each and every dream.” (I might revise Freud’s statement just slightly: Wish-fulfillment is the meaning of each and every cream.) There is a strong correlation between cosmetics and wish-fulfillment. Today, women’s dreams for themselves are marketed and sold by the ounce in the beauty aisles of department stores and, increasingly, in shops dedicated solely to beauty products. 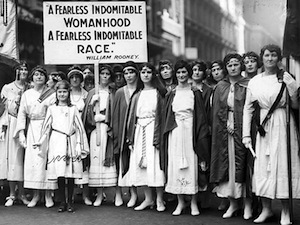 Some people are inclined to characterize cosmetics as corporate tools for manipulating women, convincing them of flaws that need attention, but the rise in cosmetics use at the beginning of the 20th century was directly tied to the women’s movement and their desire for personal freedom and expression. Many of the women who marched for the right to vote wore lipstick as a political statement. And not all dreams are meant to be life-altering. Whenever I look at the Guerlain ad, I am reminded that sometimes the best dreams are the small ones that lighten your mood—like finding the perfect lipstick.